I tend to be most productive when there is an event or goal on the horizon. 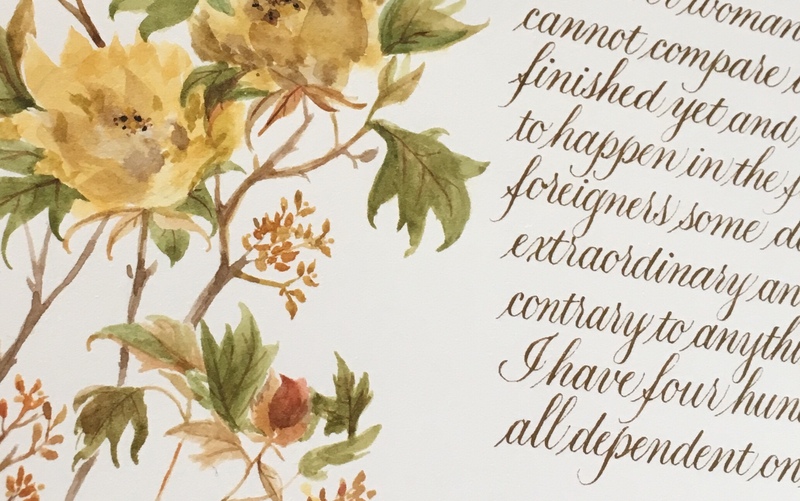 This piece, along with about 50 works by members (ranging from students to masters) of the Society for Calligraphy, is currently on display at the Bowers Museum in Santa Ana. “East Meets West: an Expression of Culture” runs from today to Sunday, February 4th, and compliments the current exhibit on the Empress Dowager Cixi at Bowers. 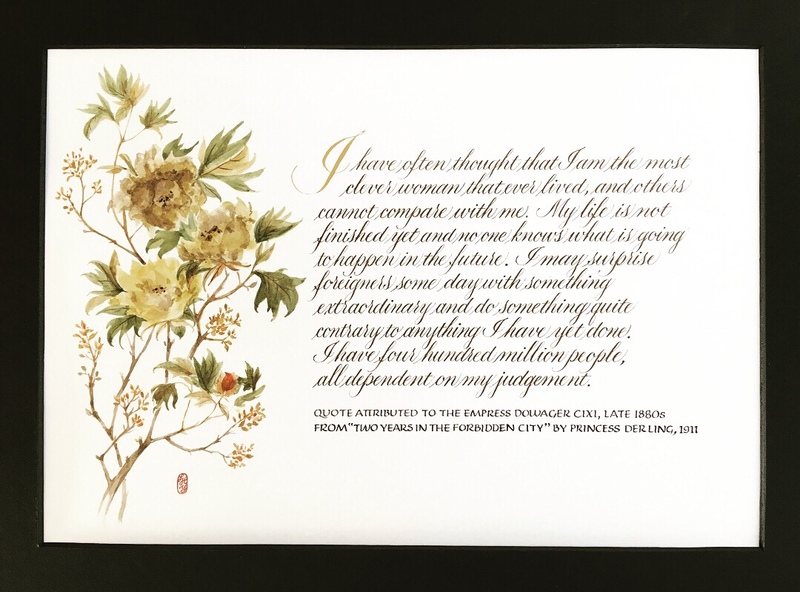 This piece was inspired by one of the empress dowager’s many paintings and cites one of her quotes, which I feel really sums up her influence on China and also the world. She was a formidable and controversial figure. I learned so much from reading “Empress Dowager Cixi: The Concubine Who Launched Modern China,” by author Jung Chang. Thanks to everyone, especially Jenny Allen who worked so hard to make this exhibit happen! Watercolor, gouache, and walnut ink on 90 lb Arches hot press, 12″x 16″. This entry was posted in Projects and tagged Bowers museum, east meets west, exhibition on January 30, 2018 by linda. Finally got some time to finish up and trim my violet piece, which will be available as part of the Art Mosaic auction at Letters California Style 2018 (Feb. 16-19) in less than three weeks! The proceeds will go to Society for Calligraphy. I had so much fun working on this piece and I hope it will go to a good home. 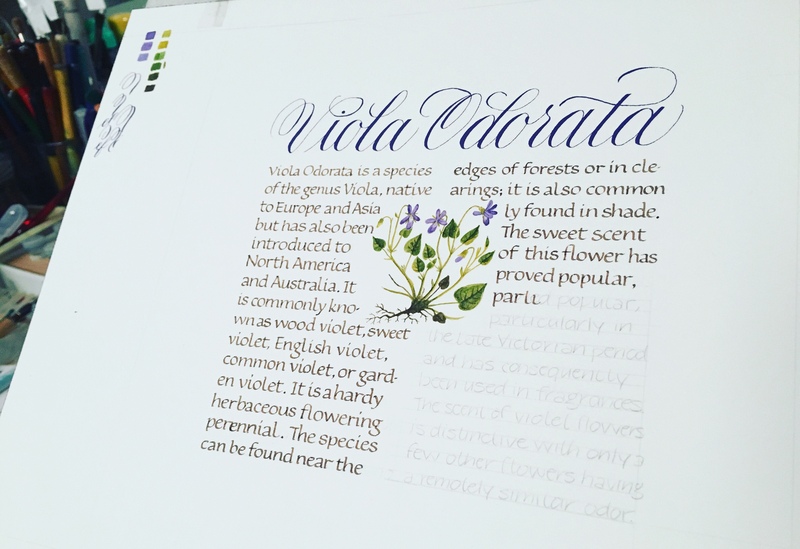 This was a really fun project – the theme of the Art Mosaic auction this year is “Flora, Fauna, and Letters,” and while I was doing research, I came across the fact that February’s birth flower is the violet. I figured it would be perfect for Letters California Style which will be in mid-February. Materials used: Watercolor, gouache, and walnut ink on 140 lb Arches hot press, using sz 0 brush, pointed pen and .75mm broadedge nib. Size: 8″x 8″. 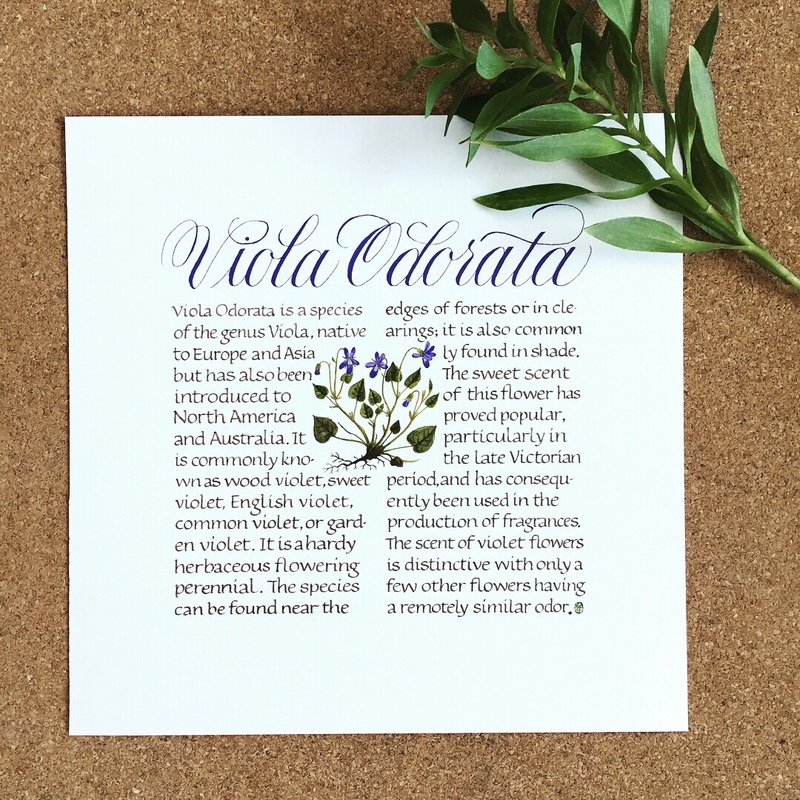 This entry was posted in Projects and tagged auction, floral, illustration, letters california style, painting, violet on January 27, 2018 by linda.